Eugene Leopold Garbaty [1885-1966], Berlin and New York, by 1931; (Paul Drey, New York); sold 1948 to the Samuel H. Kress Foundation, New York; gift 1952 to NGA. Neither Friedrich Winkler's certificate of 6 February 1931 (Kress collection records in NGA curatorial files) nor Winkler, "Simon Marmion," Pantheon 13 (1934): 70, identifies or locates the painting's owner. However, Grete Ring, A Century of French Painting 1400-1500, London, 1949: 222, no. 193 (who was apparently unaware of the 1948 sale to the Kress Foundation), gives the owner as Garbaty in New York and indicates that the collection was once in Berlin, so it is likely Garbaty was also the owner in the 1930s. His collection was probably housed at the Schloss Altdöbern, a property south of Berlin owned before World War II by the family. According to his obituary (New York Times, 8 September 1966: 47), Garbaty developed one of the leading tobacco businesses in Germany and was an art collector before his Jewish family was forced to flee the country in 1938/1939. He brought some of the collection with him. He lent several paintings to the art exhibition at the 1939 New York World's Fair (and its subsequent U.S. tour), and the dealer Georges Seligmann listed more than a dozen paintings (including A Miracle of Saint Benedict) in a January 1945 report on Garbaty's collection (Smithsonian Institution, Archives of American Art, Seligmann Papers, box 247, copy in NGA curatorial files). Masterpieces of Art. European Paintings and Sculpture from 1300-1800, New York World's Fair, May-October 1939, no. 236a, repro., as St. Benedict, St. Maurus, and St. Placidus by Simon Marmion. Masterpieces of Art from Foreign Collections: European Paintings from the New York and San Francisco World's Fairs, The Detroit Institute of Art, November-December 1939, no. 29, repro., as St. Benedict, St. Maurus and St. Placidus by Simon Marmion. Seven Centuries of Painting: A Loan Exhibition of Old and Modern Masters, Calif. Palace of the Legion of Honor and the M.H. de Young Memorial Museum, San Francisco, 1939-1940, no. L-10, as St. Benedict, St. Maurus and St. Placidus by Simon Marmion. Masterpieces of Art: European Paintings from the New York World's Fair and the Golden Gate International Exposition, Carnegie Institute, Pittsburgh; City Art Museum, St. Louis, March-May 1940, no. 11, as by Simon Marmion. Masterpieces of Art from the New York and San Francisco World's Fairs, The Cleveland Museum of Art, February-March 1940, no. 48, as St. Benedict, St. Maurus, and St. Placidus by Simon Marmion. A Loan Exhibition of Fifty Painters of Architecture, Wadsworth Atheneum, Hartford, 1947, no. 30, pl. 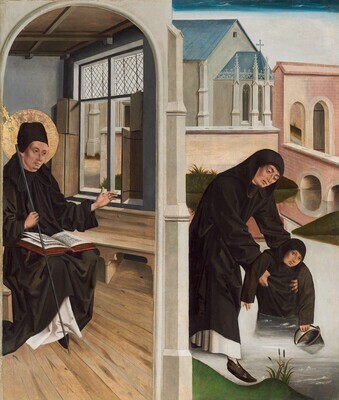 IV, as St. Benedict, St. Maurus and St. Placidus by Simon Marmion. Early Flemish Painting exhibited to accompany the lectures of Erwin Panofsky, Fogg Museum of Art, Cambridge, 1948, no cat. Winkler, Friedrich. "Simon Marmion." Pantheon (March 1934):9+, repro. Paintings and Sculpture from the Kress Collection Acquired by the Samuel H. Kress Foundation 1945-1951. Introduction by John Walker, text by William E. Suida. National Gallery of Art, Washington, 1951: 176, no. 77, repro. Paintings and Sculpture from the Samuel H. Kress Collection. National Gallery of Art, Washington, 1959: 330, repro. Summary Catalogue of European Paintings and Sculpture. National Gallery of Art, Washington, 1965: 83. European Paintings and Sculpture: Illustrations (Companion to the Summary Catalogue, 1965). Washington, 1968: 73, repro. European Paintings: An Illustrated Summary Catalogue. National Gallery of Art, Washington, 1975: 216, repro. Eisler, Colin. Paintings from the Samuel H. Kress Collection: European Schools Excluding Italian. Oxford, 1977: 238-239, fig. 228. European Paintings: An Illustrated Catalogue. National Gallery of Art, Washington, 1985: 250, repro. Conisbee, Philip, et al. French Paintings of the Fifteenth through the Eighteenth Century. The Collections of the National Gallery of Art Systematic Catalogue. Washington, D.C., 2009: no. 43, 209-212, color repro.